Are you planning for a trip to the outdoors? 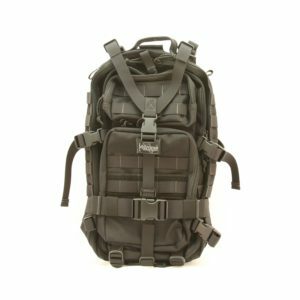 Whether you are hiking, hunting, or camping, you should consider buying a tactical backpack that can suite your everyday needs. Depending on the length of the trip, the weather, and the amount of items you wish to carry, any number of tactical backpacks can be best suited for you. 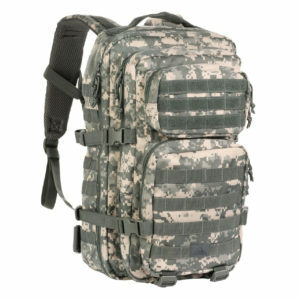 Tactical backpack are used for law enforcement, military deployment, hiking, or other ventures involving high activity. Solid tactical backpacks come with compatibility for hydration bladder and other external ports for nozzles, radio antenna, or earphones. 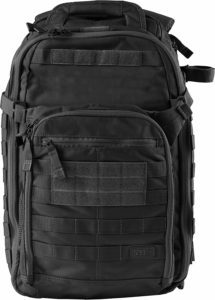 Here are a list of some of the best tactical backpacks you should choose from. 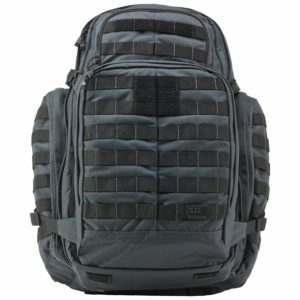 The Tactical Rush Backpack is one that can be used for military and civilian use. Suited specifically for 72 hour travel, its water repellant design makes it versatile for all weather. Its design includes a large dual-zipper back compartment, a secondary front compartment, and pockets that help your organize the interior. On both sides, there are holding pockets for 2-liter water bottles, while a pouch along the top of the rear compartment can hold a hydration bladder. To improve convenience for travel, it features locking zipper tabs and an easy access sunglasses pocket. To accommodate for more accessories, it has bottom lashing straps and MOLLE webbing for added gear attachment. Unlike the Tactical Rush 72 Backpack, this daypack is suited best for 24 hour travel. It comes in at 2,275 cubic inches. Its features include a reinforced grab-and-go handle, a hydration bladder, a fleece-lined pocket for sunglasses, and MOLLE webbing that allows for more gear attachment. Thus, this pack is best for mobile travelers. Its storage space includes three mesh compartments, a zippered side water bottle pocket, and a hook and loop area for flag patches. Its design includes a durable 1050 nylon material with a water repellant coating. Meanwhile, compression straps ensure that the pack doesn’t become too bulky. Overall, this is a great choice for a 1 day backpack. 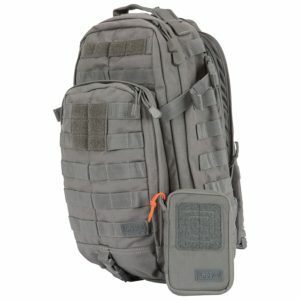 The Maxpedition Falcon II is a durable, organized pack. Its modular design is created with 1050 Denier nylon for water and tear resistance. Meanwhile, a Y-shaped midline compression strap distributes the weigh-bearing load evenly. Extra padding on the shoulder, waist, and sternum straps increase comfortability. In addition, side compression buckles give easy access to the central compartment. Meanwhile, a rear zipper pouch can allow the holding of two 100-ounce water reservoirs. The multi-layer compartments give the user an exceptional amount of space to organize their belongings as they travel. At a hefty size of 2,100-cubic inches, the Vulture II is suited for a heavy load. With three large compartments, a 100-ounce (3L) hydration bladder, it can carry a wide range of items. Additionally, PALS webbing along all sides of the pack are compatible with MOLLE accessories for further customization. To help with comfort, padded shoulder and waist straps are featured, while the waist straps can be folded into the bag when not in use. An abrasion resistant bottom improves the durability of this pack. Meanwhile, a front slant catch-all pouch and Y-shaped compression strap with D-ring attachments add versatility to this 3-day pack. The Condor 3-day pack is for those who wish to carry an excessive amount of supplies. Overall, it contains a total of seven compartments, with two compartments serving as main storage areas. These main storage areas include internal gear compression and sorting pockets. Additionally, it can hold 3-liter hydration bladders. Overall, with a storage space of 3038 cubic inches, this is a backpack that can store enough supplies for a whole week. Other features include horizontal and vertical webbing, D-ring attachments, shoulder straps, and foam-cushion back panels to add ventilation and comfort. Meanwhile, compression straps on both sides reduce your profile and keep the load relatively compact. Overall, this bag is built with quality material. The bag itself is light and allows you to move out quickly. An exceptional pack, the Vanquest Javelin Pack has an incredible 30 storage compartments. Meanwhile, it includes a laptop sleeve and two hydration pouches to increase storage. It is also quite flexible: this convertible pack allows you to store and access your gear from the top or side. The Vanquest Javelin Pack is designed so that you can spin it quickly for simple access to segmented compartments. It is also incredibly durable, with 1000-D Cordura nylon, a heavy-duty neoprene padded handle, and an s-shaped zipper tread. This bag comes in a left shoulder and right shoulder sling pack option. The one pictured here is the left shoulder option. The Rush MOAB 10 is a compact daypack that comes in at 1093-cubic inches. The defining feature of this pack is the single ergonomic cross-body shoulder strap, which can be switched for ambidextrous purposes and also contains quick access zippered shoulder pockets featuring headphone ports. The dual compartment opening ensures that there is easy packing and unloading; meanwhile, the rear pocket let you store items covertly. The pack also comes with fleece-lined sunglass pouch, a hydration pocket with an external port, and a MOLLE–compatible exterior webbing that allows you to arrange accessories. Finally, if you already have a RUSH-series bag, the Rush MOAB bag can be attached to it for pack integration. 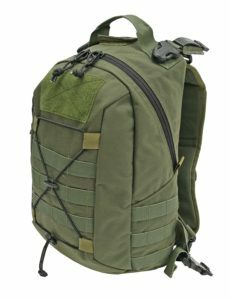 The thin Eberlstock Halftrack backpack comes in at a compact size of 2150 cubic inches of storage. With a panel that has a variety of PALS compatible webbing, Velcro badge attachment, and a tall zipper front pouch, you can easily customize the storage structure of this pack. Featuring a top modular pouch to go along with dual hydration pouches, this allows for quick and easy access even when you are mobile. Meanwhile, side compression straps help control your load-bearing. This helps minimize your profile. To combat weather, a rain cover can be pulled out from a bottom compartment to reduce water damage. 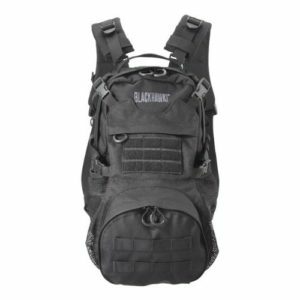 The slim Hazard 4 Evac Plan B Sling pack is a flexible tactical backpack. With an ambidextrous shoulder strap and a high-capacity carry potential, you can use the Hazard 4 in multiple conditions. 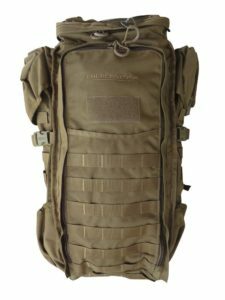 It comes in at 1,080 cubic inches of gear storage, with MOLLE webbing on both sides of the pack that allow for accessory customization. Meanwhile, a 3-liter hydration bladder allows for cool refreshment. Comfort is also a selling point. A padded thermos back offers a comfortable fit, while a clip-on stabilizer strap keeps the pack in place during heavy activity. Its design also ensures that the pack spins forward for comfort and easy-access. 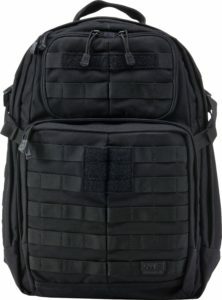 The Blackhawk Cyane is a unique backpack in the tactical backpack industry. Created with tear-resistant 500 Denier nylon, it is a tough daypack that can endure for a long time. Additionally, it has a beaver-tail style front design that allows you to store objects that are irregularly shaped. The Cyane features front zipper pouches, open-air middle storage, and a central real compartment as its main storage ares. 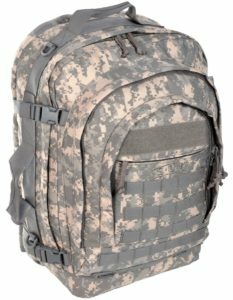 Gear such as bedrolls, jackets, and helmets can fit with ease into this day pack. 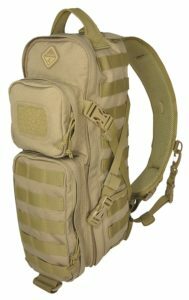 It also has MOLLE webbing along the side, front, and straps for customized attachments. Additionally, it can carry a 100-ounce water pouch with elastic-covered tube ports for the hydration hose. A mesh padded back piece with a sternum strap keeps the load easy to secure and manage. The Tactical All Hazards Prime Backpack prepares you for all situations. Recommended for professionals, it has 1,768 cubic inches of storage that can hold many irregularly shaped items. With side-mounted lanyard and three sided MOLLE webbing, you can have it customized for your preference. Meanwhile, the interior compartment has a padded laptop sleeve and hydration-system storage. For emergencies, tear out pouches and webbing for medical supplies give you the change to prepare appropriately for each and every situation. Additionally, the front clamshell compartment is lined with a high-visibility orange that will quickly alert emergency responders in times of crisis. A standard tactical pack, the Red Rock Assault Pack holds up to 2,135 cubic inches of gear. For extra storage, it contains MOLLE webbing alongside its front and side panels. To increase your convenience, a padded and ventilated back piece shields a zipper compartment that can hold a 2.5-liter hydration bladder. This will allow you to drink even when moving. 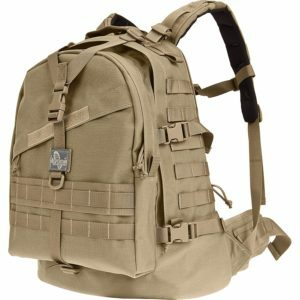 It has adjustable sternum, shoulder, and waist straps that can help stabilize your pack for carrying. Meanwhile, compression buckles help compress the bulk of the bag. For easier access, D-ring connections points are lined along the shoulder straps. 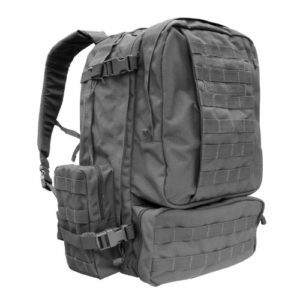 The Tactical Tailor Removable Operator Pack is a small tactical pack that is to be used either while attached to a larger MOLLE-compatible bag or carried solo as an everyday 1,178 cubic inch pack. This is a bag that is extremely durable. Created with 1000-denier Cordura nylon, it has high-tensile durability. Its design is strikingly simple. With only two main compartments and a 3-liter hydration pouch, it is made to give the user a light load. Its exterior include MOLLE webbing and a bungee system to attach irregularly shaped items. Meanwhile, padded shoulder straps and waist belts can be tucked away for packing or bag attachment. The Sandpiper pack is designed specifically for multi-day expeditions. It can hold an incredible amount of 5,600 cubic inches. However, it is also made with 1000-denier abrasion-resistant nylon and heavy duty compression straps. Thus, the Long Range Bugout Backpack can also be carried in a compact fashion. Reinforced with aluminum backstays, a shoulder harness, and a comfy waist belt, this backpack is sturdy. Customizable storage is also a feature, with an expandable main compartment, hydration pouch, and MOLLE webbing featured on the exterior. Meanwhile, a front compartment can hold smaller items. Thus, this makes this pack useful in everyday situations. The Blackhawk S.T.R.I.K.E Cyclone Pack is built for durability and speed. It is made with water-resistant nylon and features eights rows of exterior webbing. It comes in at a size of 1,800 cubic inches. The pack has a 100-ounce hydration reservoir made with Microban antimicrobial technology. Additionally, with a tube system covered in weather-resistant gear, it will make hydration on the go easier. For ease of travel, a rubber lift handle and side compression straps are featured. 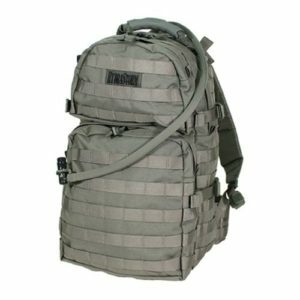 With padded straps, a sturdy waist belt, and a flexible sternum strap, you can use this pack for a high-volume carry. Meanwhile, a soft-shell back can help regulate body temperature and increase comfort. Here are a list of factors you should consider when making a decision on a tactical backpack. Material: Backpacks are either made from nylon, or polyester. They are both synthetic fibers, but nylon is a little stronger. However, you must also consider the “denier,” which is a measure of thickness of the fiber. It is symbolized by the capital letter D, with a higher denier value meaning higher thickness and thus higher strength. Capacity: A large pack may contain up to three liters, which can hold supplies that can last up to 72 hours. A smaller pack will be around one liter, which can only hold up to supplies for 24 hours. However, while the smaller pack might hold less, it is also easier to carry. Thus, you may want to weigh the pros and benefits of the pack’s size. Design: The design can include how the bag is structured to fit your needs, what color it is, or how easy it is to access the insides. Design can also mean whether the pack is fitted for you comfort. Different frames with different padding might affect your comfort with the pack. When buying a tactical backpack, make sure to try it out first. MOLLE: MOLLE stands for Modular Lightweight Load-carrying Equipment. MOLLE is composed of straps that you can attach to additional items to your bag. This gives you the additional capacity to carry on more items if you wish. If you plan on carrying more items, then make sure your bag has MOLLE webbing. Interior Storage: Some backpacks vary in the way they allow you to store items on the inside. Some have sleeves and pockets for valuables such as laptops. Others may have tear-away pouches that stores medical first aid kits. And finally others might have concealed compartments that can hide items in your bag. 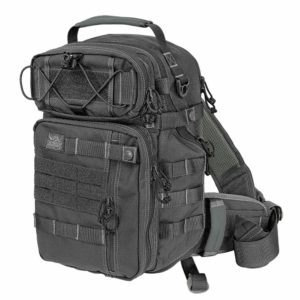 Based on this list, you can choose a wide variety of tactical backpacks that have an incredible range of features. Which one is the right one? It depends. When making a trip to the outdoors, consider the intensity and duration of your activity, the predicted climate, and what items you need to bring along. All these factor will force you to act accordingly, and you want the right tactical backpack at your side. No matter what, the best one will be the one that will always keep you one step ahead and prepared for your next journey in the great outdoors. Tactial Gear Hut is a survival and field gear blog, dedicated to the modern shooting enthusiast. Every buyer’s guide we publish is carefully researched and features the best gear, guns, accessories, and technology. TacticalGearHut.com is a participant in the Amazon Services LLC Associates Program, an affiliate advertising program designed to provide a means for sites to earn advertising fees by advertising and linking to Amazon.com. Copyright © 2019. Tactical Gear Hut. All rights reserved.